Love is most definitely in the air today and to celebrate this special day I have chosen a story with all the makings of classic fairy-tale, but with a very modern love story at its core. 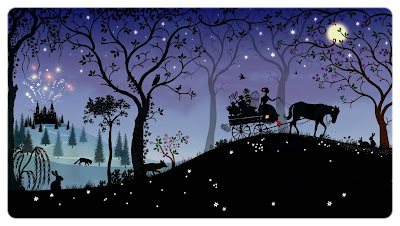 Princess has no kingdom and wonders the land on her cart pulled by her pony Pretty, looking for it, thinking that she has lost it. With no kingdom comes no wealth and Princess earns a little money but delivering awkward parcels that won’t go in the post. Other royals, although welcoming enough, treat her with slight aloofness, hiding the princes of marrying age, offering her their second-best tea and biscuits, their neglected dresses for hand-me-downs . After all, she can’t really be their equal without a kingdom. But what Princess does not own in wealth she makes up with her kind heart, cleverness and beauty. Which is why when she comes across a royal party, princes fall over each other for her favours and are more than happy to hand in their kingdoms. But what is having a kingdom at last really worth living one’s life without real love? 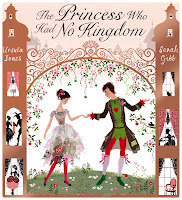 The Princess with No Kingdom has all the makings of the perfect classic fairy-tale. The story certainly holds many features of tales such as Sleeping Beauty, Cinderella, and Donkey Skin, when often the princesses are pretty and end up living in poverty until they are rescued and swept off their feet by a loving and rich prince. But Princess is a very modern type of princess, with her head well screwed on her shoulders, and she is no pushover. Those rich princes may have kingdoms which they are willing to give away, but they are just not good enough; the scene of the bunfight illustrates particularly well their decadence in contrast with Princess’ simplicity. Princess is a truly inspirational character, and this tale is distinctively original because of her. 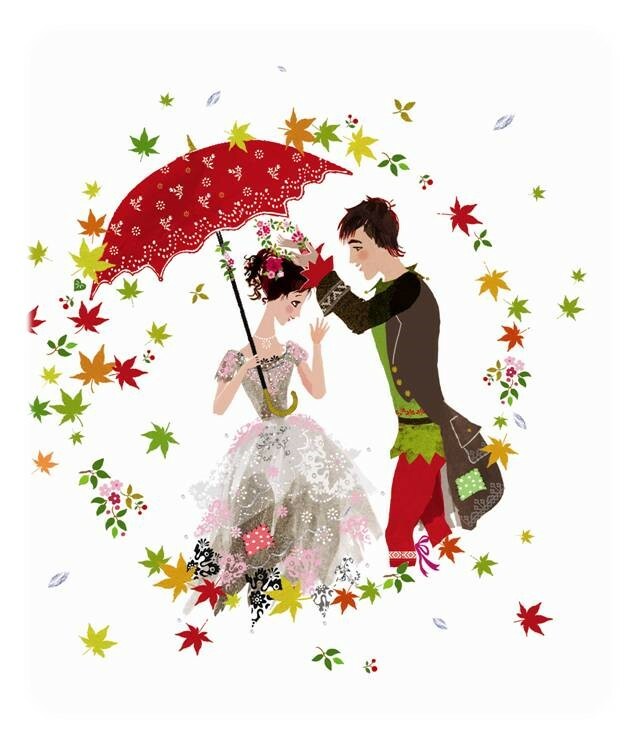 The Princess with No Kingdom does not copy the traditional fairy-tale genre, rather it modernises it: a princess who knows her own mind, who would rather be without wealth than without love, and who knows that love will bring the kind of wealth that no money can buy. And she uses the public library too! She is one princess I am happy for my little girl to look up to. 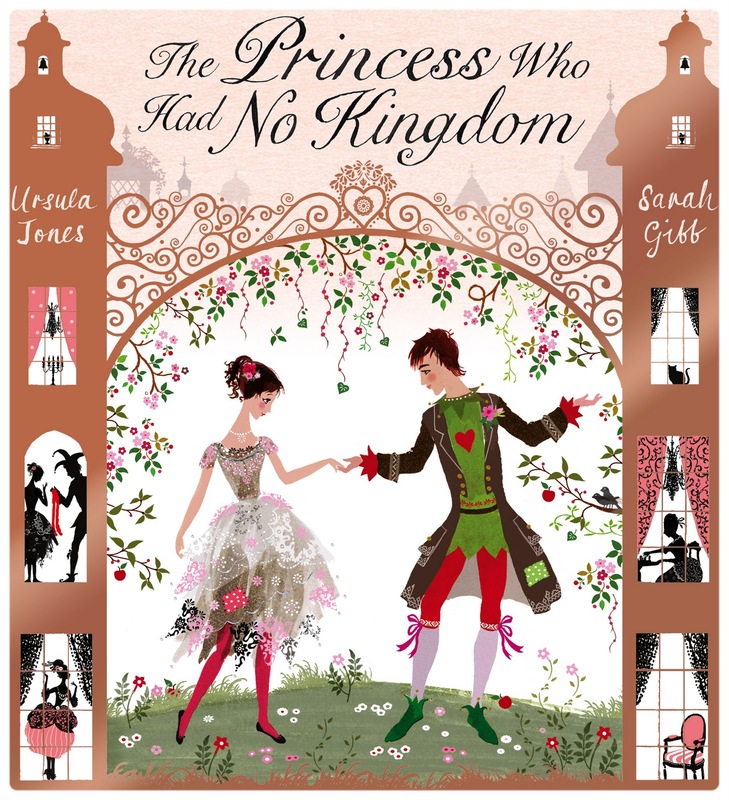 I am still in awe about the exquisite prettiness of Sarah Gibb’s illustrations (you might have read my raving review of her Rapunzel). 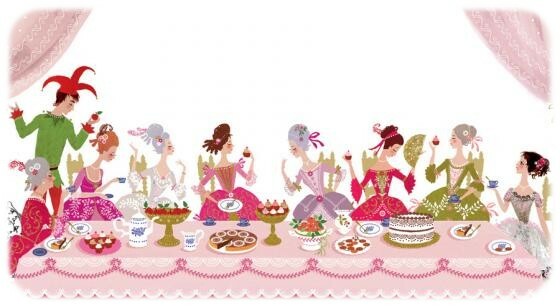 Again here, she mixes scenes entirely in silhouette, which helps convey the classic style, with fully coloured and illustrations double-spreads, with an abundance of pink and red (the colour of love!). There is a lot of attention to detail, especially in the costumes. I love the way that the Royals wear mainly clothes, wigs and make-up particular to the 18th century, which – certainly in France – is synonym to extravagance. Princess’ patched-up and yet stunning dress stands out in comparison. The artwork certainly goes a long way creating the classic fairy-tale atmosphere, as Gibb’s style suits the tone of the tale perfectly. You cannot not admire Sarah Gibb’s illustrations; it is sophisticated and elegant beyond words. The text is quite heavy so might not be one for the youngest princess fans, but will make a lovely bedtime story for emergent readers. A younger audience will still enjoy pouring over the gorgeous detailed illustrations however. This is a beautifully crafted picture book which manages to bring together the classical fairy tale with the modernity of a contemporary ending. You won’t be able to help feel elated at her eventual pairing and its implications. A classic yet truly modern love story with all the right messages, and therefore the perfect Valentine’s Day read. I thought this one was just beautifully illustrated. The illustrations are amazing, aren’t they? Such a lovely girly book!